When you call upon an amateur to service your plumbing system, it is impossible to be sure whether they have received any reputable training. It takes years of training and hands-on experience for plumbers to master their craft. The training that plumbers receive prior to entering the field ensures that they are equipped and ready to diagnose and repair complex plumbing issues that occur inside your home. Additionally, professional plumbers who have completed their training should receive a license that proves that they are capable of performing their job correctly and safely. A license proves to you, the homeowner, that the person you have hired is trustworthy and dependable. So, be sure to hire any of your plumbing services with a pro. Sure, you can walk into almost any hardware store and find some low-grade plumbing tools. However, these tools are simply not going to be as effective as the tools that a professional carries on their belt or in their service van. Professional-grade tools help plumbers diagnose and repair complex plumbing issues. Plus, professionals have a working knowledge on how to safely and correctly use these tools so that they can get the most out of them. Amateurs simply lack the professionalism that a trained and experienced plumber has. 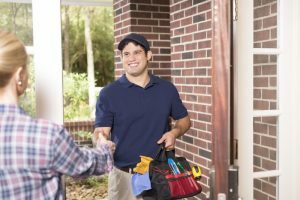 When a professional knocks on your door, you expect to be treated courteously and professionally. You want to be sure that the person you have hired truly cares about providing an excellent customer experience. Perhaps the most important reason to schedule your plumbing services with a professional is the peace of mind knowing that any problem you have will be handled correctly the first time around. The combination of training, experience, and knowledge is what allows plumbers to accurately diagnose issues and repair your plumbing system. Hiring an amateur could result in a poor diagnosis, which could result in the wrong component being “fixed”, costing you much more money in the long run. It is always better to hire a professional from the start! To schedule your plumbing services with a professional, contact Snellville Heating, Air, and Plumbing today!